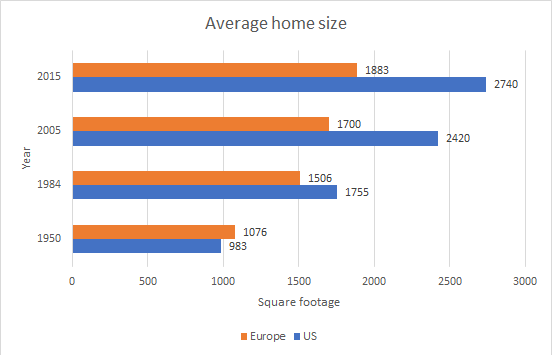 What’s the size of average homes around the world? Average income growth has been a key reason behind these different trends in the quality of the housing stock. The urbanisation process in China has transferred large numbers of workers from relatively low productivity jobs in the rural sector to higher productivity jobs in urban areas. This movement has been a driver of the rapid growth in incomes in China over the past three decades, which has far exceeded the growth in incomes in India (Graph 7). 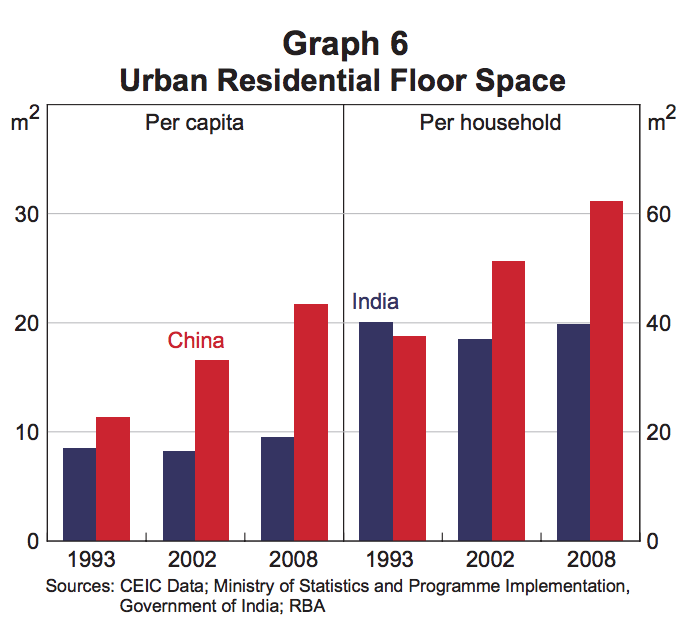 Over time, Chinese households have chosen to spend their higher income on higher quality dwellings and dwellings with larger floor space and, as a consequence, the share of concrete dwellings and residential floor space per capita has increased. Note: This graphic is a very rough assembly of data reported in mass media publications (not well-cited). 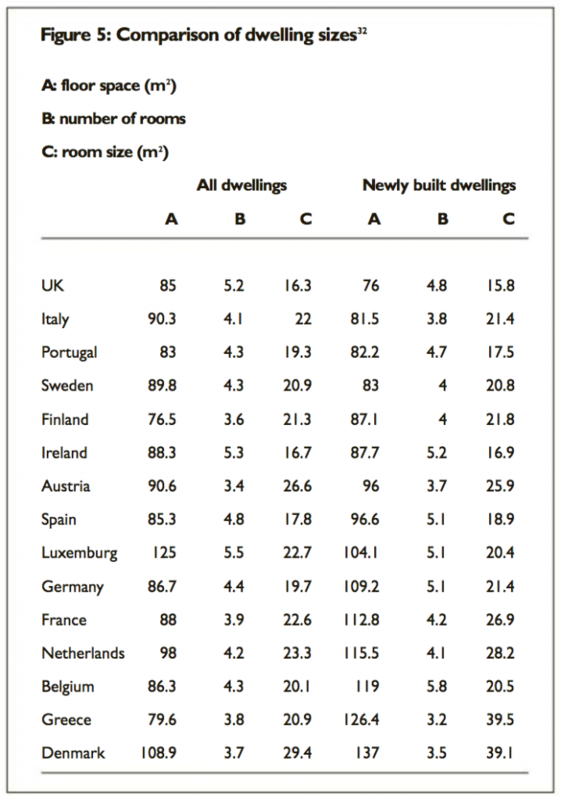 citing Japan Statistical Yearbook, European Housing 2002, Australian Bureau of Statistics, Canadian Home Builders Association, Infometrics. The following indicators describe how people use the space in their homes, how frequently they move, and how internet-connected households are. Descriptions of the way people use the space in their homes are largely qualitative and general. Some historical surveys describe general differences in home design and space use from one historic period to another, but these surveys are not quantitative. In the early 20th century, there were a few time-use and space-use studies conducted by home economists, but I’ve not seen a single source that aggregates the data from different geographic zones, and I’m not aware of any contemporary surveys. These early 20th-century studies, which mostly focused on kitchens, informed the development of minimum standards, which continued to evolve into the middle and later part of the century. Again, I’ve found single instances of minimum standard recommendations, but no historical quantitative comparisons of how the standards have evolved. I’ve come across one 10-year and one 20-year outlook describing general changes in housing plans, which may be on-going. Historic fixed-line broadband subscriptions are available from the UN’s International Telecommunication Union (ITU), 2000-2014. 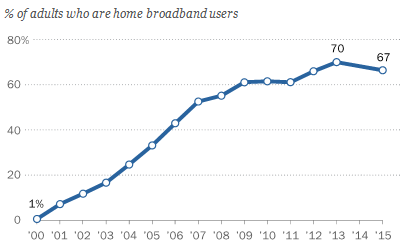 Pew surveys going back to 2000 show that home broadband adoption has plateaued between 2013 and 2015. 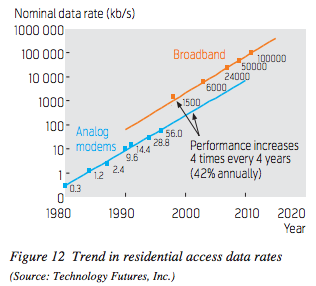 A 2009 Technology Futures broadband forecast to 2020 also shows predicts plateauing starting from about 2015. Cisco has published a four-year forecast of broadband speeds to 2019. The US Census Bureau estimated the number of times a typical American will move in 2007. FiveThirtyEight updated that estimate in 2013. It may be possible to calculate this figure for previous years using older Census data. 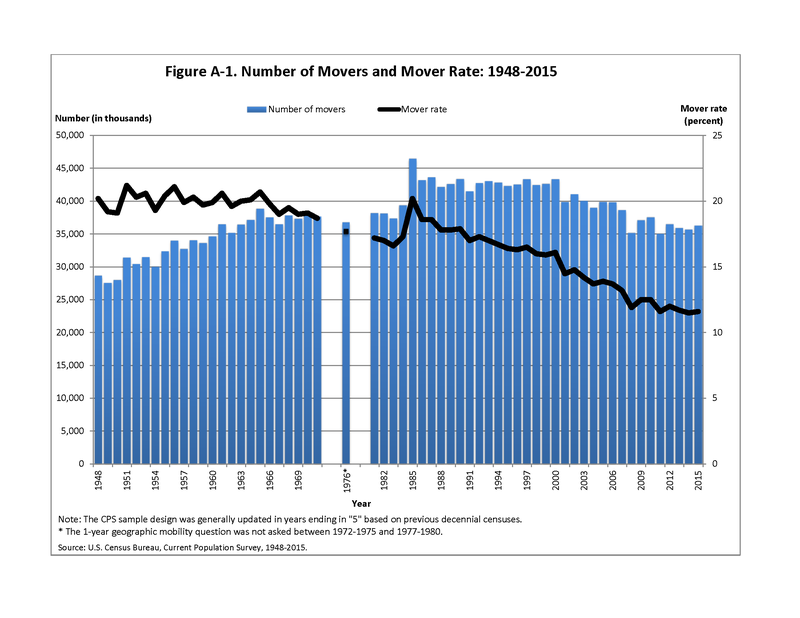 Historic estimates of the number of people moving each year are available from the Census going back to 1948. This is a general overview describing changes in the size and utilization of residential spaces, from the 18th century to present. The author has also collected excerpts from their sources here. This is an outline of a focus group conversation among 25-to-40-year-olds discussing their present housing needs, and anticipated needs in the next 20 years. Very rough notes. Appears to be a consensus for smaller square footage of homes with larger, multi-purpose rooms, and larger back yards. This document was presented at the 2009 conference “North Texas Alternative Futures” in Irving, Texas, an on-going series sponsored by the Urban Land Institute. Gensler is a global architecture, design, and planning firm. 10-year outlook for trends in residential building. Brief, and highly qualitative. Communal housing (cohousing), with shared amenities, will become acceptable to post-college adults, single parents, and the elderly. Changes in work style and lifestyle will increase the need for part-time housing. Mixed-use developments will increasingly include housing. “Uburbs,” midway between the city and suburbs, are an emerging residential market. TO-DO: CONTACT GENSLER TO INQUIRE IF THIS IS AN ON-GOING FORECAST, AND THE DATE OF THE OLDEST. “Interior Designers.” 2014. Bureau of Labor Statistics, U.S. Department of Labor, Occupational Outlook Handbook, 2016-17 Edition. Note: This 4% growth is a significant slowing from the BLS’s 2010 estimate of 19% job growth from 2010 to 2020 [average at the time]. “Interior Designers.” 2012. Bureau of Labor Statistics, U.S. Department of Labor, Occupational Outlook Handbook, 2012-13 Edition. Via Internet Archive. Virginia Tech conducted survey-based research in 2000 examining what people do in their kitchens, they have in them, what kind of cooks they are, and what they want from their kitchens. I don’t think the survey has been updated, and the research summary does not contain much specific historic information, but I’ve written to the lead author to inquire about historic data and forecasts. EMAILED 6/1. What do people do in their kitchens? What types of cooks are they? What do they have in their kitchens and how do they react to the design, layout, convenience, and function of their existing kitchens? And perhaps most importantly, what does this tell us about how to plan and design the kitchens of the future? In an effort to answer these questions, a multi-stage research project was developed. First, a content analysis of shelter, design, and kitchen magazines investigated current trends and features of kitchen design. Then a local sample of over 75 cooks was brought to the Center for Real Life Kitchen Design at Virginia Tech. These cooks were interviewed about their home kitchens and how they used them. The cooks were measured and then videotaped cooking a meal. Finally, a national telephone survey with 630 respondents gathered broad information about kitchens and cooks from around the country. *A majority of the respondents in both samples (over 90%) were from households of fewer than four people. The most common types of households were a family or adult couple (approximately 1/3 each). *Both samples included more females than males, within a wide variety of age and income brackets. *Approximately 75% of each sample lived in single-family residences they owned. There was not a dominance of any particular age or size of residence. *The national sample was equally divided among small town, rural, city and suburban residences. Key conclusions from the study can be grouped into categories: what people do in their kitchens, who is cooking, how people cook, what people have in their kitchens, and what people want in their kitchens. People have many small appliances (an average of 12 per household). Some small appliances are stored on counter tops (four is typical). Accessed June 1, 2016. This page was published in 2015, but the research was conducted in 2000, per this new release. The research informed a 2007 text book, Kitchen Planning, referenced below. One-off study from 1963 with household storage minimums (specific recommended minimums for closets, clothes closets, linen closets, kitchen storage, access, and general storage). Unable to find a contemporary equivalent. Rudard A. Jones. July 1963. Several other “universal design” papers and recommendations have been published throughout the 20th century (for example, DeMerchant & Beamish, 1995). This trend toward recommended standards began in the 1930s when home economists with USDA started systematically researching and documenting the use of time and space in homes (especially kitchens) as a way of improving rural housing conditions. Results of many early USDA time-use surveys are available here. Some home design books include discussion of recent home design trends. For example, Kitchen Planning (NKBA, 2013), includes discussion of general housing trends and consumer preferences, drawing upon recent surveys by NAHB, Better Homes and Gardens, and the American Institute of Architects. This work also includes a very general description of older kitchen and work-area research studies (like the USDA’s, mentioned above). However, the discussion focuses on the current demand, and does not give detailed attention to the pace of the change. TO-DO: IT MIGHT BE POSSIBLE TO MINE THE SURVEYS AND REPORTS REFERENCED IN NKBA 2013 FOR SPECIFIC STANDARDS FROM THE 1930S, 1950S, 1970S, 1990S, AND 2000S TO CHART THE METRIC EVOLUTION OF THE STANDARDS. THE CHAPTER DOES INCLUDE A NARRATIVE SUMMARY OF CHANGES BY DECADE FROM 1900 THROUGH THE 21ST CENTURY (MY PREVIEW TOPS OUT AFTER THE 1920S SUMMARY). NOTE: THIS WORK FOUND THAT THE NUMBER OF ITEMS STORED IN THE KITCHEN HAD INCREASED 110% FROM THE NUMBER REPORTED IN 1948 (BY HEINER AND MCCULLOUGH). How many times will a typical American move in their life? 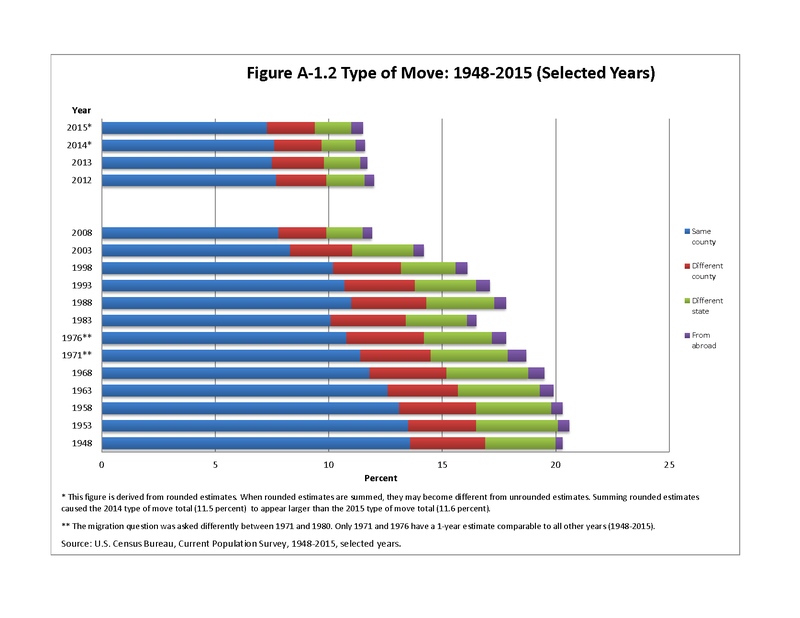 US Census Bureau doesn’t ask directly, but it calculates this figure based on which age groups are most likely to move in a given year and the overall composition of the US population. Mona Chalabi. January 29, 2015. TO-DO: FIND/COMPUTE THIS FIGURE USING CENSUS DATA FOR PREVIOUS YEARS. The Census Bureau describes their methodology here. Tables are available from 2005 through 2014 at the American Factfinder portal. 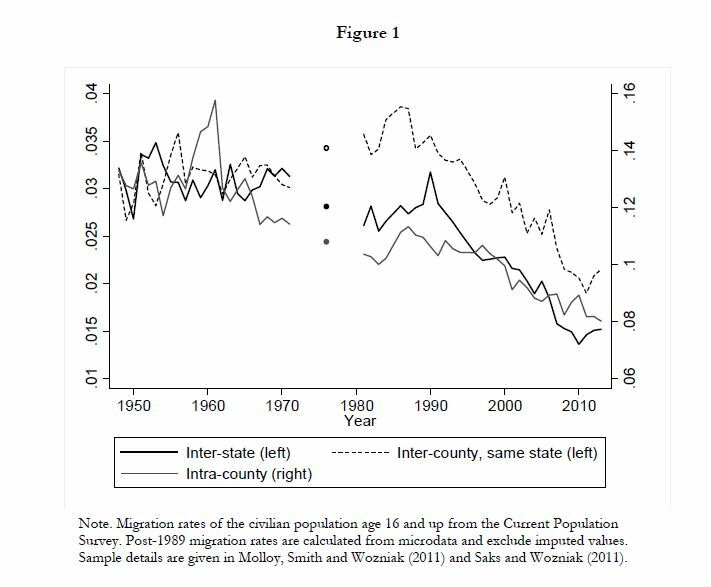 Data is also available from the decennial censuses going back to 1940, links below. 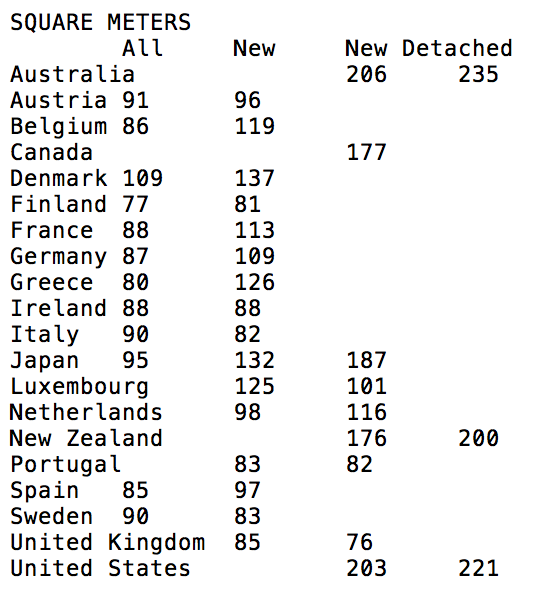 “CPS Historical Migration/Geographic Mobility Tables” 2015. 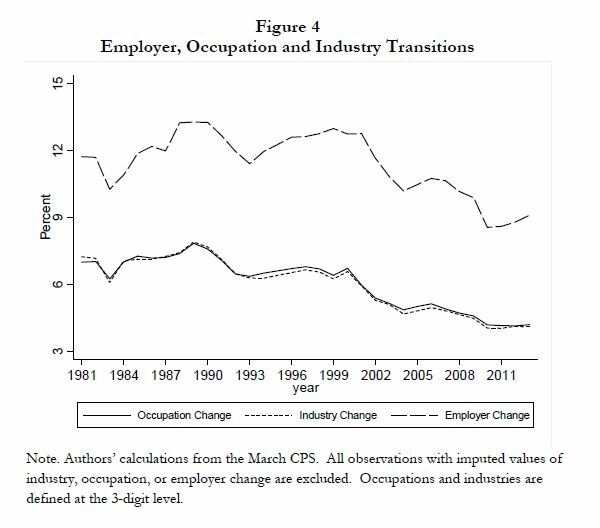 A 2014 white paper by the National Bureau of Economic Research argues that, since the 1980s, Americans are moving less because they’re changing jobs less often. Using data from the Current Population Survey, US Census. TO-DO: CHECK IF THE ANNUAL DATA ARE AVAILABLE IN THE NBER PAPER. THE PAPER IS FREE FOR JOURNALISTS TO DOWLOAD, BUT WE NEED TO COMPLETE REGISTRATION (PENDING AS OF 6/2). Raven Molloy, et al. April 2014. Richard Florida. April 28, 2014. 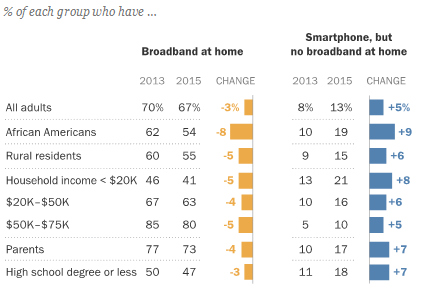 Pew also finds that several groups are shifting their home internet connectivity away from broadband and toward smartphones. Pew Research Center. December 2015. 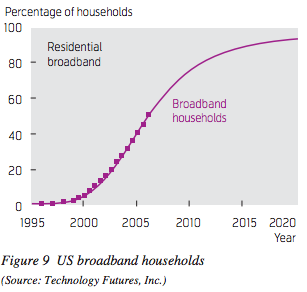 In 2002, Technology Futures published several forecasts of residential broadband subscriptions and speeds looking out to 2020. The base model forecast is informed by the Gompertz model, which is usually followed by major consumer adoptions. The forecasts are notably off from the Pew and ITU reports above. 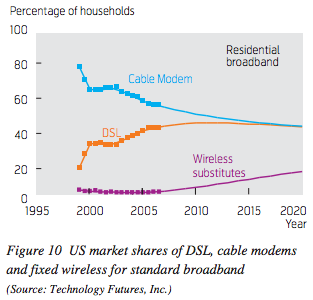 However, one of the historical comparisons in the paper, to Pay Cable adoption, might help to explain the problem with their own forecast for broadband subscriptions. 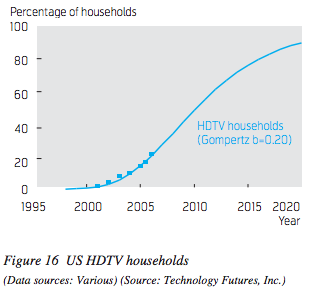 Pay Cable’s adoption figures from 1973-1981 do not follow the Gompertz model because of a disruption by VCR adoption. Home broadband subscriptions may be experiencing a similar disruption by mobile devices with internet subscriptions. Lawrence K. Vanston, et al. 2002. Lawrence K. Vanston, Ray L. Hodges. February 2009. 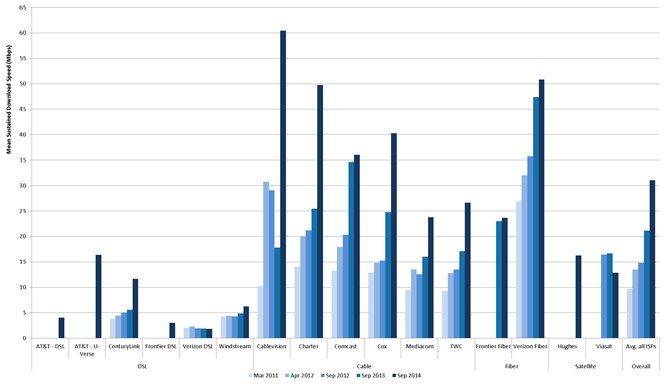 Chart 3 shows the actual download speeds experienced by each participating ISP’s subscribers — averaged across all analyzed speed tiers, geography, and time — from 2011 to 2014. The actual download speed, averaged across all participating ISPs, has tripled during this period, from approximately 10 Mbps in March 2011, to approximately 15 Mbps in September 2012, to nearly 31 Mbps in September 2014. Broadband speed is a crucial enabler of IP traffic. Broadband speed improvements result in increased consumption and use of high-bandwidth content and applications. The global average broadband speed continues to grow and will more than double from 2014 to 2019, from 20.3 Mbps to 42.5 Mbps. Table 4 shows the projected broadband speeds from 2014 to 2019. 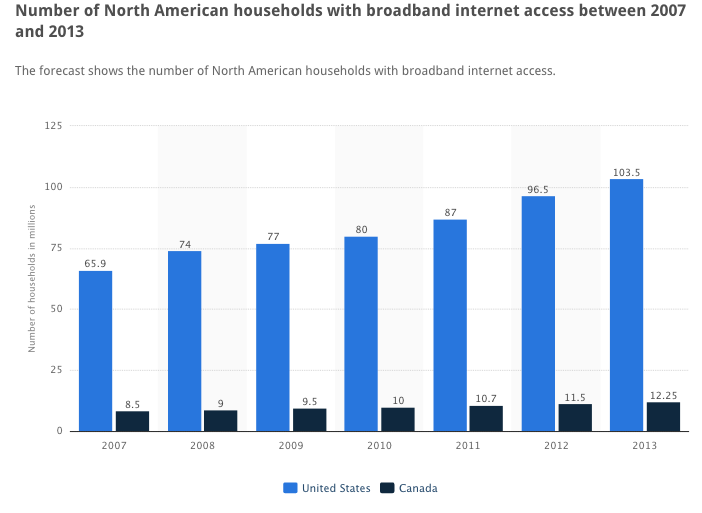 Several factors influence the fixed broadband speed forecast, including the deployment and adoption of fiber to the home (FTTH), high-speed DSL, and cable broadband adoption, as well as overall broadband penetration. Among the countries covered by this study, Japan, South Korea, and Sweden lead in terms of broadband speed largely due to their wide deployment of FTTH. Note: North America is tied with Central and Eastern Europe for the lowest CAGR. Only other year with this data available is 2014. The Current Population Survey (CPS) has asked about internet access since 1997.